The picture below is a great example of what an old and work carriage looks like next to a new one. These carriage parts are for a Genie opener. You will know if your carriage needs repair if you hear grinding noises when your garage door is operating. Or if you have a hard time closing or opening your garage door. This customer’s worn carriage also had a spring replacement around a year ago for normal wear and tear. The installer who did that spring repair installed springs that were too small for this particular garage door. This is a common mistake, but a costly one! 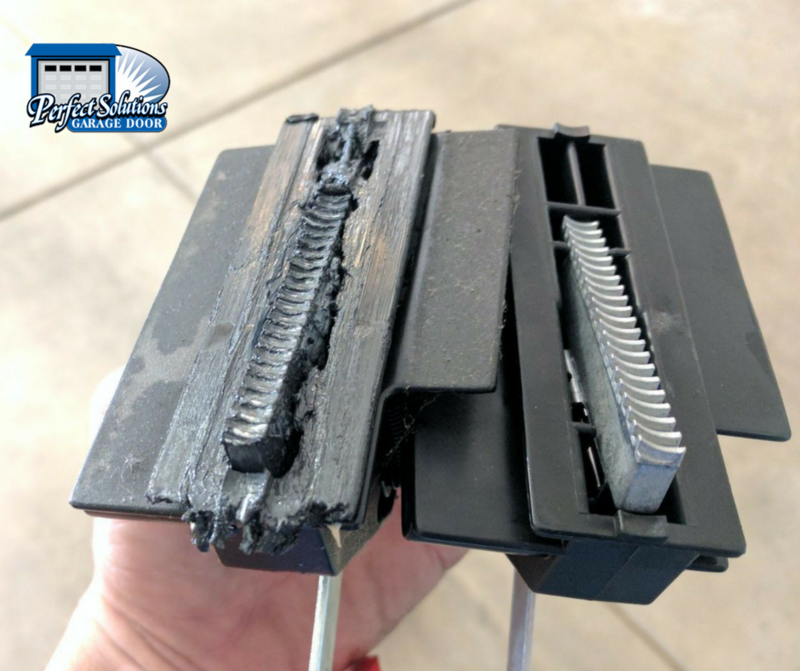 Since the springs were too small, the garage door was heavy and caused a lot of wear on the carriage. It took less than a year for it to wear out. Springs serve an important purpose. They help to carry and balance the weight of the garage door so your garage door lifts properly. When the springs can’t handle the weight, it puts the burden on the opener, which then weighs down the trolley carriage. Once the wear and tear is too bad,the garage door won’t open at all, or will open but not easily. You can hear the grinding sound in the video below. Keep watching, and you’ll see the difference once we replaced the trolley carriage. The first thing we did was just replace the trolley carriage itself. We used a brand new carriage, which you can see in the image at the top. It’s an easy and quick fix, and not very expensive. This repair took us less than an hour. After we did that, we installed the right size springs. We adjusted the tension so the springs will carry the weight of the garage door properly. This entry was posted in Blog, Garage Door Repair and tagged spring repair, trolley carriage repair. Bookmark the permalink.